a moulder (hand or machine) q.v. who specialises in preparing moulds for casting, and in casting axle boxes, or axle bushes, principally for railway work. superintends mixing and melting of bell metal (hard bronze, an alloy of copper and tin), and makes a loam mould in which he casts a bell in casting pit of bell foundry thus: fixes crook (a double compass of wood whose legs are shaped like cross section of bell) on to pivot of stake firmly fixed in bottom of casting pit; builds up core of inside of bell with mixed sand, clay, bricks, etc., using inner leg of "crook" to obtain correct shape; plasters on moulding sand, grease and tan dust with trowel; lights fire inside this core to dry it thoroughly and then when dried, plasters clay on it with trowel till clay coating is in form of bell itself (outer leg of "crook" acts a� guide in making boll of clay); models by hand and with hand tools, top or "crown" of bell in clay, thus completing clay hell; dries this bell and bakes whole by means of a second fire kindled inside core; when cool, places on clay bell, wax moulds of any ornamentation, scrolls, figures to bo cast on bell; covers surface of clay bell with grease and tan dust by band, and then builds up sand mould outside clay bell ramming sand firmly round bell, places bricks in mould to help it to bind; completes making of outer sand mould, and makes pouring gates, and risers; when dried, raises it off clay bell, which be carefully breaks away from core; lowers mould again into correct position over core; pours molten bell metal from crucible or ladle into mould; leaves mould and casting to cool and -when cold, supervises breaking down of mould and removing of bell for fettling, etc. ; term also applied to proprietor of bell foundry. a hand moulder q.v. who makes small moulds at bench, instead of on floor of foundry; cf. green sand moulder. caster (brass foundry), foreman caster, principal hand, principal tub hand, sand caster; superintends melting of brass, bronze, etc., placing weighed quantity of copper in crucible set in furnace, and adding gradually, weighed quantity of zinc; makes mould and fits in the core ready for casting, duties as for moulder (hand or machine); pours metal into moulds when it has reached correct temperature and superintends removal and cleaning of casting; in some cases, making of mould is done by a second hand or moulder and brass caster merely superintends work of foundry, and attends to actual pouring of metal, cf. caster (184); all work of moulding is done at a moulding tub which resembles a large wooden trough, in consequence a brass caster is known as the "principal tub hand"and his assistants as "tub hands"; sometimes specifically designated according to article cast, e.g. brass letter caster, brass lock caster, brass weight caster. looks after heating of crucibles in furnace in which copper and zinc are melted together; puts cores in core oven to dry; makes moulds (see hand or machine moulder) and fastens in cramps; in other than large works, sometimes does work of brass caster q.v. a moulder (hand or machine) q.v. or a plate moulder q.v. who specialises in casting metal chairs for railways. a moulder (hand or machine) q.v. who attends to melting of copper in crucible in furnace; prepares moulds, and pours molten copper therein to form copper rollers. reduces size of core, or finishes it by rubbing it with a wire file; usually done by coremaker q.v. (ii) (machine) makes cores by any of above hand methods, except that ramming of clay and sand is done by machine press, which holds core box; pulls lever operating mechanical ramming apparatus; in all cases carefully cuts vent holes in core with special tools to liberate any gases generated on pouring; in more complicated cores inserts waxed threads in core, the wax melting in drying oven and being absorbed by sand to leave vent channels; sometimes specifically designated, e.g. , ploughshare coremaker. makes metal core bars revolve on strong cast iron trestles while core maker q.v. winds on hay or straw bands, and affixes mixed clay, sand, core, gum, etc., on a circular core. a moulder (hand or machine) q.v., using dry sand with addition of certain amount of old loam, which is dried before use, to make moulds; is usually engaged on production of long large moulds for castings such as pipes, columns, and flywheels. a hand moulder q.v. who makes moulds on sand floor of foundry; usually done in case of large moulds to avoid unnecessary lifting. general term for any worker engaged in casting yellow metals, including brass caster, brass moulder q.v. ; usually prefixed by name of metal worked in, e.g. , brass founder, bronze founder. a moulder (hand or machine) q.v. who specialises in making moulds for casting those articles which can be best cast in green sand moulds, i.e. , moulds which do not need to be dried in the core oven; cf. bench moulder, floor moulder. makes moulds in which molten metal is poured to produce castings; shovels sand in lower box (drag) of moulding "flask" till it is full; then places wooden or metal pattern, made by pattern maker (480) q.v. , in centre of box and using mallet, hammers it into sand until approximately one-half is submerged; smooths off rest of sand, ramming it firmly into! position round pattern, removes pattern, sprinkles facing sand, a mixture of fine sand and coal dust, in mould shape produced; hammers pattern again into sand to bind fresh sand added, and then, after removing pattern again, coats whole of sand surface with "blackwash" containing carbon, using hand brush; replaces pattern, places upper box of moulding "flask" on lower one, and fills this with sand, carefully ramming sand firmly, by hand, round pattern; as sand is put in and rammed, also puts in with sand, metal supports which help sand to retain shape when upper box is removed; removes upper box, turns it over, sprinkles finer sand in mould shape made by pattern, presses it again on pattern, and then paints moulded surface with black-wash as was done in case of lower box; replaces upper box on lower and with sharp metal instrument, makes hole down through sand to pattern, and heaps sand round top of hole to form pouring hole for caster (183) q.v. ; removes upper ibex, takes 'out pattern, sprinkles a little "parting" sand (burnt sand) on upper surface of lower box, then replaces upper box, clamping it firmly to lower one; sets mould aside ready to be thoroughly dried in oven, after which it is ready for caster; in case of mould in which cores are required, moulder also places "core print" in sand with pattern and on finally removing pattern and core print (wooden pattern of core itself) replaces latter by core. fixes an iron core or chill in mould in place of whole or part of ordinary sand core, so that the surface of casting is cooled rapidly and so hardened. makes moulds of loam, a mixture of clay, sand and chopped straw, usually without aid of a pattern to be used in casting large, more or less circular objects; builds up foundation on special plate or on floor of casting pit, using loam bricks and loam which is wet and easily worked; levels off foundation, fixes spindle vertically in centre of plate and fixes templates on to spindle by means of which he builds up outer mould, or "cope," with loam bricks and loam, and also builds np core in similar way; "faces" both "cope"' and core with plastic loam and smooths them off with trowels and scrapers to coincide with templates supplied, revolving template on spindle to ensure uniformity in all parts of mould; leaves space inside core for fire to be made (if mould is too large to be dried in core oven), and superintends making of fire; fixes plate on top of mould when finished and clamps upper and lower plates together; in case of core which is loose inside mould, fixes it in position, using template as a guide, and by means of holts and nuts, fastens it to upper and lower plates; when mould is complete, dries it ready for caster. makes moulds by machine for use in casting articles in metal; work involved depends upon type of machine; (hand moulding machine ) as for plate moulder, except that separation of upper part of "flask" from pattern plate is performed by moving lever; pattern plate is then rapped, and carefully removed, when after coating mould with "blackwash", hand machine moulder clamps parts of flask together and removes them from machine ready for drying in oven; (moulding press ) as for hand moulding machine above, except that ramming is done by moving lever operating press (hand, steam, pneumatic, or hydraulic) which descends on sand and squeezes it into all crevices and interstices of pattern; (moulding machine ) as for plate moulder, except that moulding sand is shovelled into filling frame from which it passes into "boxes" or upper and lower parts of "flasks" by moving a lever; ramming is also done by moving levers, and upper part of "flask" and pattern plate are moved up and down—for removal of plate and coating of mould with blackwash — by mechanical means. a specially experienced moulder who prepares core irons, i.e. roughly cast iron framework on which more complicated and large cores are made, and supervises fitting up of boxes. a highly skilled hand moulder q.v. who makes, for repetition machine moulding, a metal mould which is afterwards machined to accurate dimensions by metal machinist (200) q.v. so that the beet and cleanest castings only may be obtained from it. general term covering any type of moulder, e.g. hand moulder, machine moulder, plate moulder, floor moulder, bench moulder, etc. ; sometimes specifically designated according to metal to be cast in moulds made, e.g. aluminium moulder, brass moulder, bronze moulder, gun metal moulder; according to type of sand used as moulding medium, e.g. green sand moulder, dry sand moulder, loam moulder, sand moulder; or according to article to be cast in mould made, e.g. chair moulder, hollow-ware moulder, nail moulder, pipe moulder, roll moulder, shell moulder, stump moulder (street pillars). a plate moulder q.v. or a machine moulder q.v. who makes moulds to be used for casting nails. a moulder (hand or machine) q.v. who makes moulds using an oddside mould as a pattern; "oddside" mould is very carefully prepared by a more skilled moulder, for use in repetition work, e.g. gas stove bars; it is a plaster of Paris cast of a number of patterns fixed in correct position in mould. 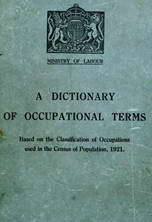 a jobbing or general moulder (hand or machine) q.v. who makes moulds, from any type of pattern in green or dry sand for casting articles for various trades and general purposes. a moulder (hand or machine) q.v. who uses a wooden pattern to make moulds in which iron or other metal patterns are to be cast for use by other moulders; (work is necessarily very accurate, as errors in mould would be repeated in every casting taken from subsequent moulds made by master metal pattern). a moulder (hand) q.v. who makes moulds for casting pipes on a sand heap (called a bank) using boxes set on an incline and not vertical boxes used by pipe pit moulder q.v. a loam moulder q.v. who sets out and supervises work of other loam moulders. a moulder (hand or machine) q.v. who, in making a mould for a thin complicated casting, or number of castings (when several moulds are made together), makes a runner and a number of gates for each casting, to ensure that molten metal can run into all parts of mould quickly and that imprisoned air and generated gases are easily able to escape; (when caster pours molten metal into mould, it fills up runners (pouring holes) and gates (ventilation holes), and, as a result, when cooled and sand is removed, cast metal runners and gates form a spray). general term applied to moulders, getters-down (185), etc. q.v. a moulder q.v. engaged in making tuyeres for blast furnaces by the usual moulding methods.